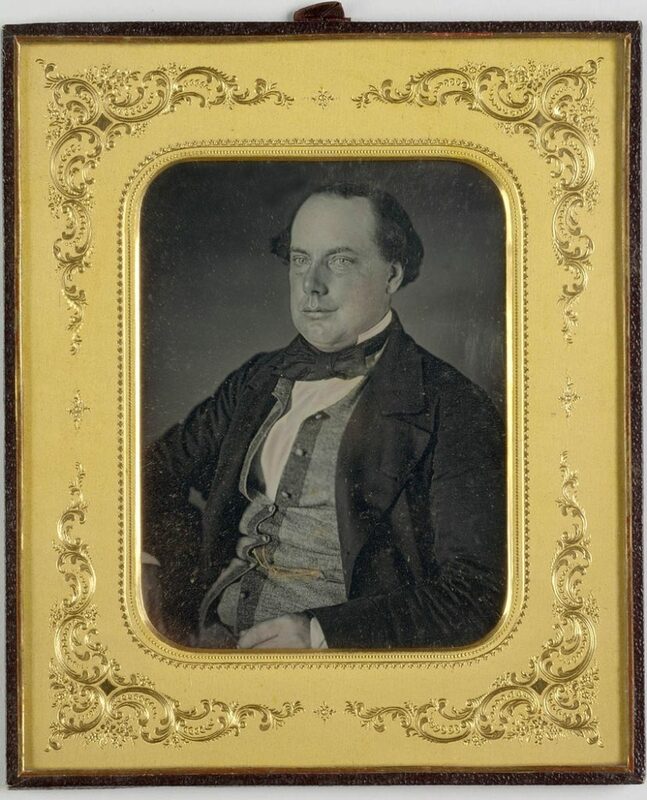 This left facing ½ length hand-coloured daguerreotype portrait shows George Coppin, aged 36, in a seated pose against a plain backdrop in the Pitt Street studio of Thomas Skelton Glaister’s American and Australian Portrait Gallery. Recently arrived from New York, Glaister brought the technical sophistication, size and style of American photography to his Australian daguerreotypes and collodion processes. In July 1855, Glaister’s photographic studio was located next door to the Royal Victoria Theatre where Coppin, a colonial celebrity, was once again performing to packed houses (SMH, 12/7/1855); the impresario was also due to be married later that year. Coppin wears an unmatched ensemble of garments comprising a double-breasted, loose-fitting ‘sac’-type jacket of dark woollen cloth with wide notched lapels and long, fitted sleeves worn with grey trousers, a crisp white wing-collared shirt with a dark [silk] ribbon bow tie, and an unusual long-line waistcoat, or undershirt, of two-tone [grey] woollen cloth with a turn back collar and an eight button closure fastened at the waist with a gold fob chain threaded through the buttonhole and draped across his torso to the pocket on the left in which his [watch] is stored. He is clean shaven and wears his dark wavy hair curled over his ears and brushed back from a receding hairline. A comic actor by profession, Coppin was described as ‘a common man [who] possesses a certain rudeness of manner which is very unpleasant when things do not run smoothly…he dives both hands deep into his side pockets and looks both blank and black and gives short and curt answers … a well-bred man of the world has the art to hide such feelings’. Actor, theatre manager, politician, George Selth Coppin (1819-1906) was an enterprising speculator who grew up in the uncertain world of the itinerant theatre – solemn-faced and tubby, he was found to have a flair for comic acting. Credited as a father the Australian theatre, Coppin was key to the second phase of its development through the introduction of his ‘pernicious “starring tours” of visiting celebrities’ (ADB). In 1842 Coppin had decided to leave England for lands of greater promise – a toss of the coin decreed Australia over America, and he arrived in Sydney on 10 March 1843 with his de facto actress partner. Coppin subsequently acquired ownership of New Queen’s Theatre, Adelaide in 1846, Theatre Royal, Melbourne in 1856 and the Haymarket, Melbourne in 1862. When the gold rushes struck, Coppin quickly realised a means of making a fortune by entertaining miners heading to town on the spree. In 1853 he went back to England where he ordered a prefabricated iron theatre to be built in Manchester, equipped with special scenery and a lavish wardrobe, for an Australian tour headed by tragedian, Gustavus Brooke. Coppin married Harriet Hillsden, née Bray, sister-in-law of Gustavus Brooke, in August 1855; three children were born in quick succession before the death of Mrs Coppin (post-childbirth) at Richmond, Vic., in 1859. Her 18-year-old daughter Lucy Hillsden took charge of the household. Coppin married Lucy on 4 June 1861, and their first child was born on 5 January 1862. After touring Australia, New Zealand and America, Coppin entered politics and became a Member of the Legislative Council (1858-1863, 1889-1895), and a Member of the Legislative Assembly (1874-1877, 1883-1888) in Victoria. He died at his home in March 1906. Glaister, Thomas, fl. 1855-1870, attrib. Subject is posed in front of a plain studio backdrop.